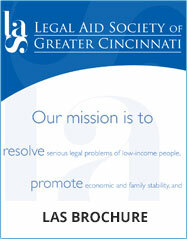 To better serve the Southwest Ohio region, Legal Aid Society of Southwest Ohio LLC, was established in 2007, as an affiliate of the Legal Aid Society of Greater Cincinnati. Since then, Legal Aid has assisted families and individuals in seven counties: Brown, Butler, Clermont, Clinton, Hamilton, Highland and Warren counties in Southwest Ohio. We serve clients from two full-service offices: one in Cincinnati and one in Hamilton, as well as a satellite office at Children’s Hospital Pediatric Primary Clinic in Avondale. Legal Aid ensures access to the justice system for all, not just those who can afford to pay. Our mission is to resolve serious legal problems of low-income people, to promote economic and family stability and to reduce poverty through effective legal assistance. All requests for legal assistance from the Legal Aid Society of Southwest Ohio, LLC are handled, according to a management agreement, through a central reception and intake system managed by the Legal Aid Society of Greater Cincinnati. We provide free, comprehensive, civil legal assistance to address a wide range of major social and legal obstacles. For example, we help to prevent homelessness, obtain freedom from domestic abuse, provide access to health and income benefits, and overcome barriers to employment. By resolving legal problems for the most vulnerable in our community, we help them achieve greater economic and family stability. Our approach is two-pronged: to help individuals with case-by-case problem resolution, and to use legal advocacy to improve systems, often by forming collaborative service and advocacy projects with other human services organizations. Legal Aid also provides leadership to coordinate our services with other non-profit and government agencies, to develop innovative programs, and to present community legal education. Call the Legal Aid Line to request assistance at 513.241.9400 or toll free at 1.800.582.2682. Monday-Friday: 8:45 am to 4:30 pm. You do not have to come to our offices to request help. The Legal Aid Line is the same for Legal Aid Society of Southwest Ohio, LLC and Legal Aid Society of Greater Cincinnati. When you have an appointment with a Legal Aid Society of Southwest Ohio attorney at our downtown Cincinnati office, please come to the second floor reception area. This reception area is shared by the Legal Aid Society of Southwest Ohio, LLC and the Legal Aid Society of Greater Cincinnati and is open from 8:30 am to 5 pm. As part of the management agreement, The Legal Aid Society of Greater Cincinnati manages all administrative services for the Legal Aid Society of Southwest Ohio, LLC including communications, development, human resources, finance, operations and technology. The Legal Aid Society of Southwest Ohio LLC does not receive any funding from the Legal Services Corporation (LSC). If you have any questions, please contact us at info@lascinti.org.